As you suggested, Dave and I will discuss the possibility of an even greater conservation easement. I hope to continue to work together throughout this process. We are waiting for the proposal from RSA+ Civil Engineers regarding traffic improvements, and I would appreciate the opportunity to discuss these suggestions with you. Again, thank you for your interest and input on the design of this project. I am writing in regard to our proposed Bloodlines LLC Soda Canyon Vineyard Development (Project P16-00323). As you know, the Environmental Impact Report (EIR) includes scientific evaluations to determine that this project has less than significant, or less than significant with mitigation measures, impacts on the environment. I appreciate the expertise of the scientists that conducted these studies, and respect and strictly followed the regulatory process in place to apply for a vineyard development permit set by Napa County. I will leave the technical analysis to the scientists, but I would like to present a more personal outreach of how our project could contribute to the well-being of our community. From day one, we have met with neighbors and asked what issues are most important to them regarding development on Soda Canyon Road. We heard loud and clear that traffic, water, and more recently climate change are top priorities for local residents. We share the same priorities. Traffic is an issue on Soda Canyon Road. I personalize this by imagining my children driving this road to our family vineyard, and that image has led me to a few ideas of how to minimize our impact on and improve the safety of the road. One measure included in the EIR project description to address travel hazard is to provide pilot cars before heavy equipment is moved up the road. A neighbor had requested this, so I am glad that it was incorporated into the EIR. To reiterate, we are not applying for a winery nor a tasting room permit that would lead to additional tourist traffic on the road. Our employees will meet offsite and travel together in a van rather than in individual cars. This will result in fewer cars traveling the road, as well as decreased emissions. We will reach out to neighboring vineyards and invite them to participate in a similar program, with the hope of starting an employer-funded network of Vanpools. We have consulted with the Department of Public Works and RSA+ Civil Engineers to determine how to increase the safety of the travel and infrastructure of the road. How can we slow down traffic? One idea is to install, at our cost, a blinking sign or signs that show each driver the speed at which they are travelling. According to the Department of Public Works, these signs do effectively slow drivers down. Another idea is to install, at our cost, reflective signs to warn of upcoming hazardous curves. A suggestion that was offered by a concerned neighbor was the installation of a guard rail or rails at especially dangerous parts of the road. We of course would hope that these would never have to be used, but if it increases the potential for safety, we are for it and will pay for the design and installation. One neighbor asked if our well water usage might impact his well water availability. According to our Water Availability Analysis included in the EIR, we will not impact neighbors’ water supply as with our deficit irrigation strategy we will use less water than is annually recharged. However, as detailed in the EIR we will monitor neighboring well levels and adjust our well use if we cause impacts to neighbors’ wells. The EIR actually determined that water quality will be improved after our project is developed, as we will take engineered measures to prevent sediment runoff. Please reference Section 4.6 Hydrology and Water Quality in the EIR to read details of our mitigation measures to ensure that there are no significant effects on water quality or neighboring water quantity. The EIR has declared that our Project has a less-than-significant impact to climate change. My team and I agree that climate change is something that we all need to actively work to halt if not reverse. The calculations used to determine our impact were based on pre-Atlas Fire conditions. Since then, most of the property and its ground cover burned. Planting vineyard and covercrops should greatly increase the carbon sequestration from current conditions. We support the inclusion of the oak stand in Block 3G in the Multiple Resources Protection Alternative to ensure that the mature oak trees are avoided. 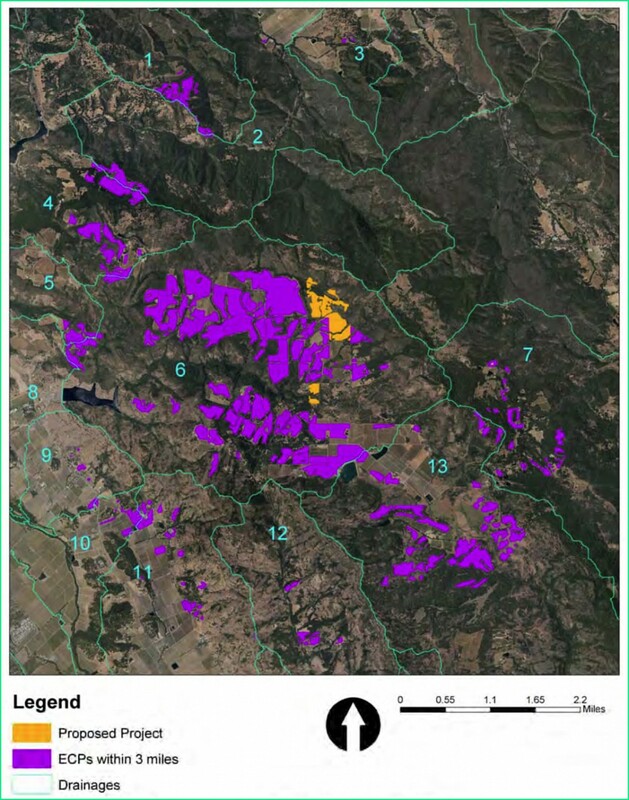 Although the mitigation measure calls for an 8.2-acre area of oak woodland outside of the proposed clearing limits be preserved through a conservation easement, we commit to preserving at least ten times that acreage. Mitigation measures request 0.24 acres of Ceanothus purpureus (CEPU) be transplanted at a 1:1 ratio outside of the clearing limits. We are willing to plant an additional 0.24 acres of CEPU outside of the clearing limits to bring the ratio up to 2:1. Although as currently written the EIR does not require any planting of oak trees, we will be voluntarily replanting oaks on our property outside of the clearing limits in the appropriate habitats. We will consult with a qualified biologist to determine placement and species. As we were all reminded of in 2017, fire is threat to our families, properties, and livelihoods. My brother-in-law was a volunteer firefighter for 13 years, and I can’t thank him enough. My team worked with the Fire Chief of the Soda Canyon Volunteer Fire Department and we provided much needed upgrades to their fire station, including repairing dry rot, replacing the garage doors, repainting the firehouse, and repaving the driveway. If the Department decides that it would benefit from a well and a water storage tank on site, we will set up a timeline to pay for these improvements. We commit to maintaining the building as needed, it is the least that we can do in return for their service. From the beginning of this application process we have engaged our neighbors, listened to their concerns, and incorporated these into the design of our project wherever possible. We will continue to do so from this day forward and look forward to contributing to the Soda Canyon neighborhood.